Although they are usually listed together as 'giant planets', the gas giants and the ice giants are very different from each other. Jupiter, at a heliocentric distance of 5.2 AU, is the most massive and the largest, as well as being the giant nearest to the Sun. Its diameter is about a tenth that of the Sun, and its mass about a thousandth of a solar mass. Situated just beyond the ice line, Jupiter was best placed to capture the greatest number of planetesimals, and rapidly grew larger. How long did it take for Jupiter to form? A few million years, and perhaps less. Its growth must have preceded the dissipation of the protosolar gas during the youthful Sun's T Tauri phase (see p. 72). Observations of nearby young stars reveal that this phase seems to last for not more than about 10 million years. It seems necessary, therefore, to accelerate the accretion process, and it is not ruled out that the planet might have migrated inwards, thereby increasing the amount of material available to be captured by its gravitational field. We have seen how this process has been invoked to explain the presence of giant exoplanets close to their stars. Jupiter and Saturn, imaged by Voyager 1. With their rings, and satellites orbiting in their equatorial planes, these giant planets resemble miniature solar systems. Neptune (left) and Uranus (below), imaged by Voyager 2. The two ice giants -20 and 30 AU from the Sun - grew more slowly than the gas giants Jupiter and Saturn, which are nearer to the Sun. Uranus is shown in true colour at left, and in false colour at right. critical mass after the protoplanetary gas had been swept away during the Sun's T Tauri phase, so that little was left to be drawn in towards them. With their ring systems and large numbers of satellites orbiting in their equatorial planes, the giant planets resemble miniature solar systems. The collapse of the protosolar gas onto their original nuclei must have led to the formation of their own protoplanetary disks, from which the ring systems and satellites evolved. What is striking, however, is the diversity of the systems engendered by this process. Jupiter boasts four large satellites, but its rings are all but invisible; Saturn's rings are extensive, and it has many small satellites and, further out, one large one, Titan, with an atmosphere; Uranus and Neptune have very tenuous, narrow rings; and Neptune's large satellite Triton, with its thin atmosphere, is probably a captured object. The four inner planets of the solar system are also characterised by remarkable diversity. On the sunward side of the ice line they were formed from a quantity of refractory material only, and their accretion phase must have lasted longer than that of the giants. Computer models predict the formation, over a period ranging from a few tens of millions to perhaps 100 million years, of only a few embryonic rocky planets, of masses lower than or similar to that of Earth. Mercury, the nearest planet to the Sun, is too small and too hot to have been able to retain a stable atmosphere, and even relatively heavy gases such as carbon dioxide would, at such temperatures, have attained escape velocity. The other three terrestrial worlds have atmospheres doubtless formed partly from material delivered by meteoritic infall, including interplanetary fragments, asteroids and comets, and by outgassing. The atmospheres of Venus, the Earth and Mars must initially have had the same global composition - carbon dioxide, water and molecular nitrogen - but each must subsequently have evolved very differently. While atmospheric pressure at the surface of Venus is currently a hundred times greater than it is on Earth, on Mars the value is only one hundredth! Venus's surface temperature of 730 K is much greater than might be expected, given its distance from the Sun. Finally, while the atmospheres of Venus and Mars are indeed composed of carbon dioxide, with a little nitrogen, the constituents of the Earth's atmosphere are molecular nitrogen and oxygen - a radically different result. Venus, imaged by the Galileo probe in 1990, and the Earth. Venus differs from the Earth in that its water vapour has contributed to an intense greenhouse effect, raising its surface temperature to a scorching 730 K.
Mars is less massive and colder than the other terrestrial planets. Lacking sufficient mass to engender the internal energy required for the production of a dense atmosphere, It has undergone only a modest greenhouse effect. The greenhouse effect is a mechanism involving the warming of the surface and lower atmosphere of a planet or a satellite. The surface, warmed through absorption of the Sun's visible light, radiates energy in the infrared. If this radiation is itself absorbed by gases in the lower atmosphere, this layer will aiso warm up, and the surface temperature will rise further. The mechanism is self-amplifying. Carbon dioxide and water vapour, with their strong spectral signatures in the infrared, are particularly effective greenhouse gases. atmosphere became progressively richer in oxygen. Mars - considerably less massive and cooler than its two sister planets - had insufficient internal energy to be able to engender a dense atmosphere, and therefore experienced no strong greenhouse effect. Its atmosphere, which was probably denser in the distant past, has gradually become cooler and more rarefied, and water is now present only as ice and permafrost. 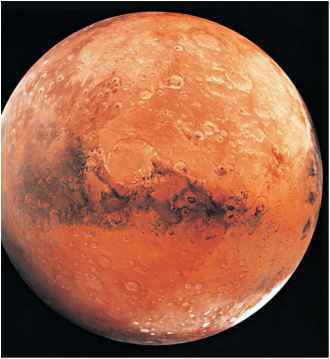 It is, however, very probable that liquid water flowed across Mars in the early stages of its history; and perhaps life developed. 4.9 BETWEEN TERRESTRIALS AND GIANTS: THE MISSING PLANET? If we consider the distances of the planets from the Sun, we can see that they are strung out according (approximately) to an exponential, empirical law: the Titius-Bode law - the formula for which is D = 0.4 + 0.3 2". D is the heliocentric distance of the planet in question, and n has values of (- oo ) for Mercury, from 0 to 2 for the other terrestrial planets, and then rises incrementally from 4 through the giant planets and Pluto. This relationship holds (with a 5% error) for all the planets out to Uranus, but fails in the case of Neptune (22%). Modern calculation suggests that the Titius-Bode 'law' does not represent any physical reality, but is based on mere chance. There is, however, an interesting property of this relationship: there is no planet corresponding to the value n = 3. What is the significance of this gap between the terrestrials and the giants? Of course, there is something there: a multitude of lesser bodies, the asteroids. A rotation sequence of the asteroid Gaspra, imaged by the Galileo probe in 1991. Spectral types of asteroids as a function of heliocentric distance. The silicate asteroids (S) tend to be nearer to the Sun than the carbonaceous variety (C). Distribution of semimajor axes of asteroids. Most of the known asteroids follow (sometimes highly) elliptical orbits, with eccentricities between 0.01 and 0.3 and inclinations not far (less than 30°) from the plane of the ecliptic. Juno. Ceres is about 1,000 km in diameter, while all the others are smaller. More than 10,000 asteroids are now listed. 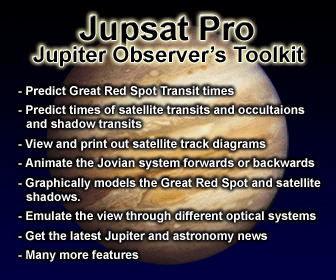 Sky surveys, especially in the infrared, have largely contributed to the lengthening list of 'minor planets'. 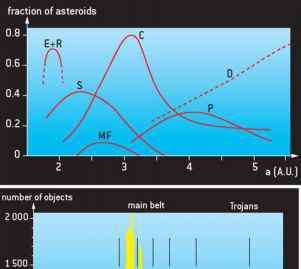 The nature of the asteroids has been revealed to us through their visible and infrared spectra, which provides information on the composition of their surfaces. As a result of their low gravity, none of them has any atmosphere. Some are metallic in nature, some are silicaceous, and some carbonaceous. These differences seem to reflect the temperatures of their environments of origin. Globally, the densest asteroids are closest to the Sun, while the more primitive carbonaceous asteroids move through the farther regions of the main belt and beyond. Here again is evidence of the stratification of matter within the disk as a function of temperature (of distance from the Sun). 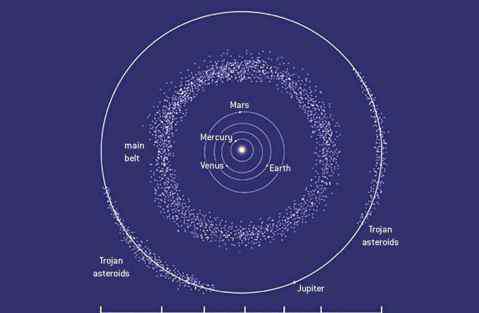 The main asteroid belt - where the greatest concentration of asteroidal orbits is found - lies between the orbits of Mars and Jupiter (2-3.5 AU from the Sun). Beyond this belt orbit the Trojan groups, following Jupiter's path; and further out still, the Centaurs move between the orbits of Jupiter and Neptune. models simulating the formation of celestial bodies, it is thought that the mythical planet never existed - again because of the presence of Jupiter. Most of the planetary embryos became members of the main asteroid belt. Remember that there are other 'minor planets' which follow other orbits. Of most interest to us are the 'Earth-grazers', the orbits of which are close to that of the Earth. Although the probability of a collision is very small, we cannot discount this kind of hazard completely. The history of the Earth offers evidence of such events in the past, with consequent profound effects upon its ecosystem. Certainly, the impact of an object about 10 km across was, for the most part, responsible for the demise of the dinosaurs at the Cretaceous-Tertiary boundary (K-T boundary) 65 million years ago. Continuing down our list of solar system objects we come to the comets: small, but by no means little known. Comprising a nucleus of ice and rock (usually no more than 10 km across), these wanderers in space follow very elliptical orbits, usually far from the Sun and the Earth, but when they approach us they can appear as spectacular objects. As the ices of the nucleus sublimate, gas and dust are ejected, reflecting sunlight and producing long luminous trains. 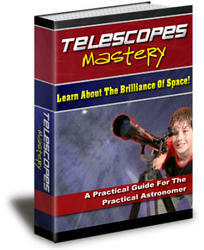 Since ancient times, comets have inspired fear and superstitious awe. Not until the eighteenth century was the nature and periodicity of comets identified, by English astronomer Edmond Halley, who is chiefly remembered for his prediction of the return, in 1758, of the comet which now bears his name. Where do comets come from? The two reservoirs of comets in the solar system are the Oort Cloud, between 104 and 10s AU from the Sun, and the Edgeworth-Kuiper Belt, between 30 and 100 AU. This diagram (not to scale) shows a section through these reservoirs along the plane of the ecliptic. The Edgeworth-Kuiper Belt is situated more or less in this plane, but the Oort Cloud is somewhat shell-like in form, extending to high heliocentric latitudes. 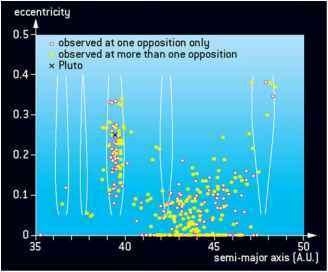 Eccentricities of trans-Neptunian objects as a function of the semimajor axes of their orbits. The dots represent the positions of objects with well-known orbits. The different zones of resonance (4:3, 7:5, 3:2...) are shown. Objects which, like Pluto, are localised at around 39 AU, are called Plutinos. They are in a 3:2 resonance with Neptune (their respective periods are in the ratio 3:2). 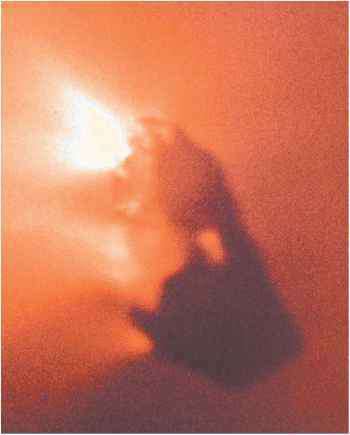 The nucleus of Halley's comet, imaged by the Giotto probe in 1986. The lighter parts correspond to sites of gas and dust emissions. nearest to the Sun) were ejected from the main solar system by gravitational effects due to the giant planets, especially Jupiter. These comets now populate the Oort Cloud - a spherical halo of bodies situated between 40,000 and 100,000 AU from the Sun. At this distance some of them already lie at a third of the distance to the next star! External perturbations sometimes send comets inward from the Oort Cloud, towards the vicinity of Earth. There are also comets which formed beyond the orbit of Neptune. These form part of a recently discovered population of objects collectively known as the Kuiper Belt, which contains the remnants of planetesimals formed within the protoplanetary disk beyond the orbits of Uranus and Neptune. It lies in the ecliptic plane, between 30 and 100 AU from the Sun. 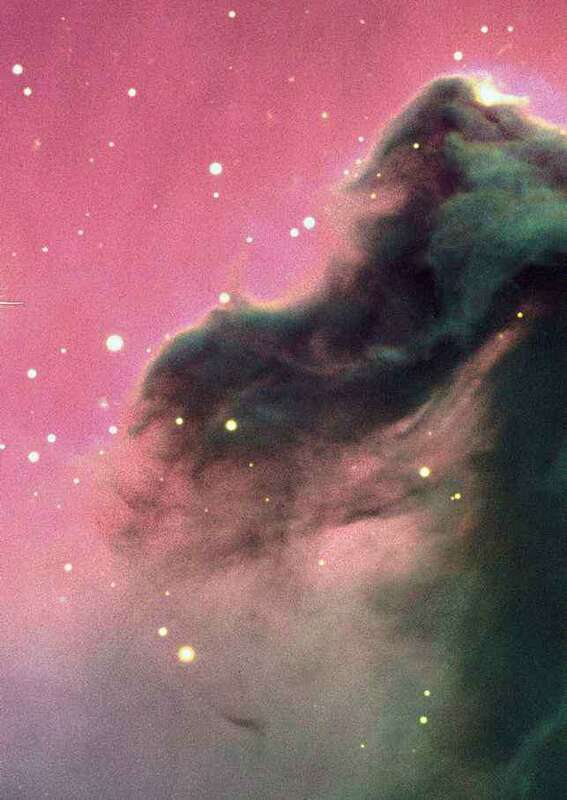 Its existence was predicted in the mid-twentieth century, as a result of theoretical studies by the astronomers Kenneth Edgeworth and Gerard Kuiper. Not until the 1990s did it become technically possible to detect Kuiper Belt objects. About 1,000 trans-Neptunian objects are now known. It is probable that they have large icy nuclei, and the largest of them have diameters of several hundred kilometres. It now seems that Pluto - a body previously classed as a planet which has long intrigued astronomers with its unusual nature and eccentric orbit - is merely one of the largest members of this new class of object. The existence of the Kuiper Belt has taken its place within the framework of exoplanetary research, and the region may well have equivalents in other protoplanetary disks or in the outer environments of other stars. It is possible that an excess of water vapour around the evolved star W Hya is evidence of the volatilisation of its Kuiper Belt, heated by the star as it evolved into a red giant.